Bank officers attending customers. Photo: Hemant Mishra/Mint. Mumbai: Hours after the Reserve Bank of India (RBI) raised its policy rate by a quarter percentage point and freed the savings bank rate on Tuesday, Yes Bank Ltd raised its minimum lending rate by 25 basis points to 10.5%, and the rate on its savings bank accounts by 200 basis points to 6%. The rest of the industry hasn’t hurried to follow suit, and in any case two bank holidays followed the quarterly policy announcement. SBI was not in a hurry to raise the rate, he said. Other banks too were non-committal. “We have to sit and decide," said Bank of Baroda chairman M.D. Mallya, who also heads industry lobby group Indian Banks’ Association (IBA). 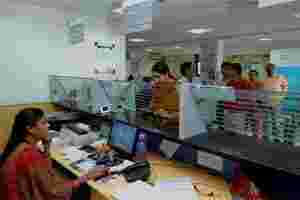 Chennai-based Indian Overseas Bank is yet to discuss the savings bank rate, said M. Narendra, chairman. “Our treasury has to see what kind of innovative products they can design but for that we would need the detailed guidelines of RBI," he said. Uco Bank chairman Arun Kaul said, “Banks will have to strike a balance between maintaining the charges levied on such accounts and interest costs. Initially, you can expect some turmoil in the market, which will settle down in a couple of months. It is difficult to say how soon we will do it." The effects of deregulation may take a while to play out, bankers and analysts said. “Wherever deregulation has happened, it has immediately resulted in some increase in the prevailing rates," said a top executive at state-owned Canara Bank. “At the same time, deregulation can theoretically lead to lower rates also. In the current circumstances, it is possible that there will be a slight increase in the rate." Only two banks raised loan rates after RBI increased the policy rate by a quarter percentage point in September. This time too, banks may not increase rates as they have stopped raising deposits since there aren’t enough avenues to deploy credit due to poor demand, the Canara Bank official said. Analysts peg the highest that the savings bank accounts can offer at 6-7%. Since the account is a checking account from where money can be withdrawn any time, every transaction will have a cost for the bank. A bank also has to issue cheque books, etc., for the customer and provide several other facilities. “What Yes Bank has done seems to be near the maximum. If banks hike rates beyond that, they will have to charge for other facilities. So it will be either low interest with free facilities, or high interest with no facilities," said a senior banking analyst with a foreign brokerage. Analysts also doubt whether banks will enter into a rate war as customer acquisition in savings accounts will not help banks much unless they are able to cross-sell other products. Analysts see state-run banks acting in concert while retail-focused private banks fight for customers. They also don’t see banks passing on the rate hike this time. “Monetary transmission has also to be viewed taking into account the guidance of the RBI, which indicates that long-term interest rate will fall. We have to revise the rate keeping that in view," Andhra Bank chairman R. Ramachandran said. However, savings bank rate does not look like to be going down from the present level. “Today, there is no scope for reducing interest rates (on savings bank)," Ramachandran said. Bank of Baroda’s Mallya ruled out an immediate pass on in loan rates to the borrowers or hike in deposit rates simply because credit growth is not good while there is liquidity in the system. Somnath Sengupta, executive director and chief financial officer at Axis Bank Ltd, said though they have not decided on whether to hike rates on savings bank deposits, the bias appears to be on the upside. “It’s too early in the day but competition would probably keep the bias on the upside. And as the base rate is dependent on the cost of funds, a higher savings rate may mean higher lending rates," he said. Kotak Mahindra Bank Ltd and IndusInd Bank Ltd are both meeting on Monday to decide whether they should hike rates both on loan as well as savings bank deposits. K.S. Sridhar, chief risk officer at IndusInd Bank, said the decision will be taken at the asset liability committee meeting on Monday. Mohan Shenoi, treasurer at Kotak Mahindra Bank, said the bank is yet to decide whether there should be a change in rates. “It’s not necessary that an increase in the savings bank rate will directly result into an increase in the lending rate. We have to calculate our position," he said. About 13% of Kotak Mahindra’s deposits are savings accounts.